"An amazingly moving and emotional story that any woman―or any parent―can easily relate to." ―Jennifer Hamilton, Editor, Canadian Family magazine Expecting Sunshine is a multi-award-winning memoir and a Kirkus Review BEST INDIE BOOK of 2017 Anyone who has experienced--or knows someone who has experienced--miscarriage, ectopic pregnancy, stillbirth, or other forms of pregnancy and baby loss should read Expecting Sunshine, including those considering or already pregnant again. After her son, Zachary, dies in her arms at birth, visual artist and author Alexis Marie Chute disappears into her "Year of Distraction." She cannot paint or write or tap into the heart of who she used to be, mourning not only for Zachary, but also for the future they might have had together. It is only when Chute learns she is pregnant again that she sets out to find healing and rediscover her identity--just in time, she hopes, to welcome her next child. In the forty weeks of her pregnancy, Chute grapples with her strained marriage, shaken faith, and medical diagnosis, with profound results. Glowing with riveting and gorgeous prose, Expecting Sunshine chronicles the anticipation and anxiety of expecting a baby while still grieving for the child that came before--enveloping readers with insightful observations on grief and healing, life and death, and the incredible power of a mother's love. Letter from a reader: I just finished your beautiful book Expecting Sunshine and felt compelled to reach out and say thank you. A few days after I found out I miscarried, a few days before my D&C, I went to Barnes & Noble in hopes of finding a guidebook or self-help book of how to heal and cope with miscarriage or loss of a child. I searched every feasible location: self-help, psychology, family planning, childcare. With tears in my eyes I was too embarrassed to ask anyone at the counter for help. There I was already utterly heartbroken and feeling more alone than ever. Not a single book for me to turn to. I pulled out my phone, googled "books about miscarriage" and found your book and ordered it on the spot. It must not have been easy for you and your family to share your story, but I hope you know what an impact you've had on me and likely so many other women. You've given me so much hope for my year ahead. --Katie Rhodes, Oakland, California Second Edition includes: Bonus chapter written from the author's husband's perspective. 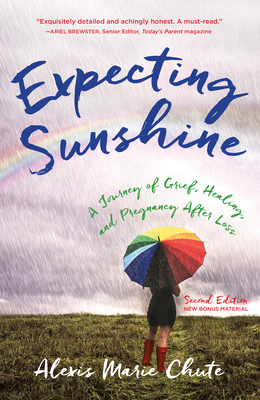 Plus, resource section, group discussion questions, and Q&A with author Alexis Marie Chute www.ExpectingSunshine.com.